Norway, and Faithorn UMC effective July 1, 2011. Churches before accepting her new assignment in Norway. Previous pastoral experience also included a half-time position as Associate Pastor at First United Methodist Church in Escanaba. Local Pastors' School at Union College in Barbourville, Kentucky. It is a hope to pursue full ordination in the United Methodist Church. 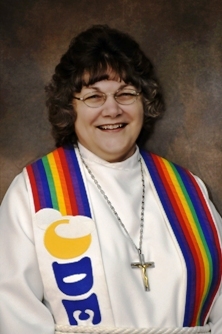 She presently serves as Secretary of the District Executive Coordinating Council, District Board of Missions and Church Extension and Camp Michigamme. She also serves on the Conference Leadership Team of the Detroit Annual Conference. Personable and outgoing, Pastor White believes her strengths include administration, organization, the ability to adapt to new situations quickly, and to work well with other people. She also describes herself as "strongly ecumenical." She is optimistic that church revitalization is possible, even in small church setting. "If people are being fed, church growth will happen. We are called to be the heart and hands of Jesus to a hurting world," she added.